If you enjoyed the Prototype film Hacked, let's take a look behind the scenes with writer/director Tim Baldini. A: A lot of talented individuals took time out of their busy work schedules to help me make #Hacked, and I owe them more than just an end credit. 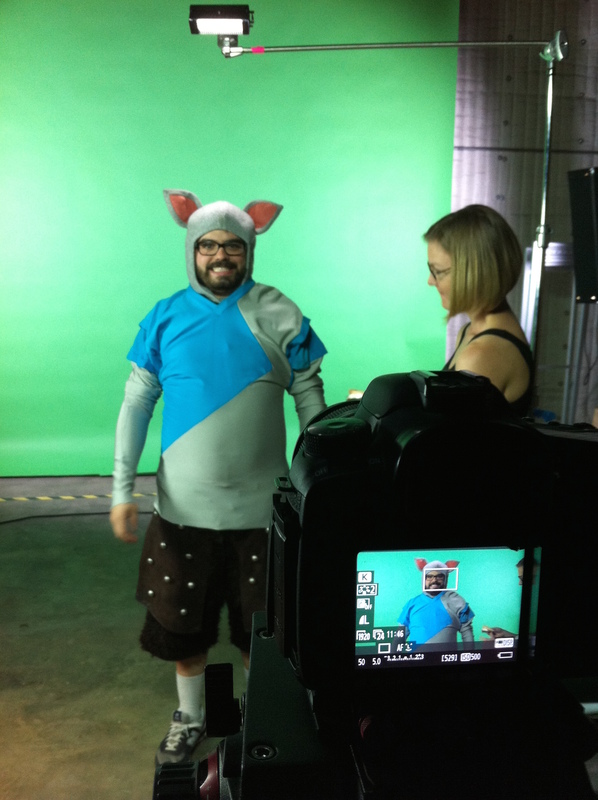 Joe Burke who plays Rickroll Patrol headed up our wonderful cast, and he did an amazing job in front of the camera. I needed a very charismatic cosplay geek who could also pass as a YouTube sensation, and Joe created the character perfectly. Sherrie Henderson over at Dream Big Casting helped me get in contact with Shelby Young, who plays the tougher Tate sister, Ryder. I first saw Shelby on TV while watching an episode of American Horror Story, and I immediately became a fan. When you meet her in real life and realize how different she is from the majority of the characters she plays, you start to get a real sense of the level of talent that she possesses. 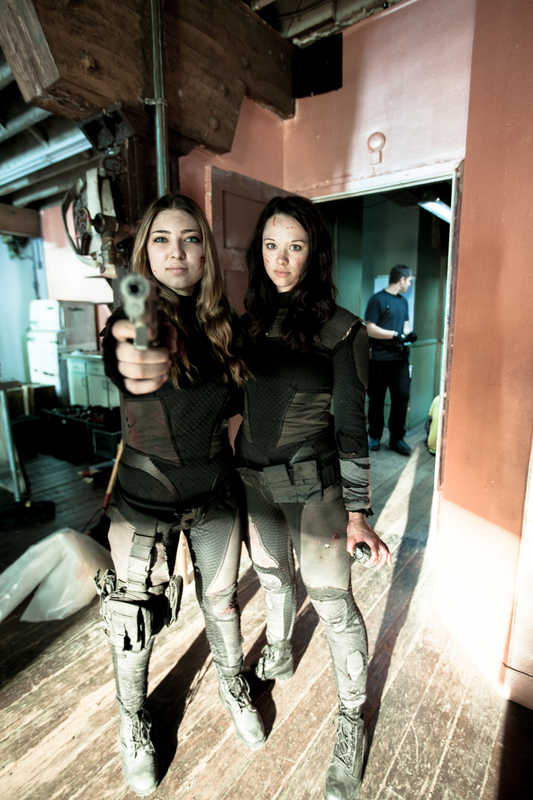 Shelby also worked tirelessly on the action sequences in the film, performing all of her own stunts (like a boss). I think we saw over two hundred actresses in three days before finding Shannon Hollander to play the role of the brainy Tate sister, Audrey. When Shannon first read for us, we immediately knew she was the one. She possesses the perfect balance of strength and vulnerability, and every performance she gives is grounded and believable. I really hope the entire cast gets recognized for their hard work on this film, because they all did such a wonderful job. I truly couldn't be happier with their work. I also need to mention the people behind the scenes who worked 14-20 hour days, sometimes with no sleep at all, while helping me make this film. My amazing producing partner (and wife! ), Joanna Coelho, stood by my side through thick and thin, from casting to color correction. Joanna produced alongside a close friend of ours, Marina Stabile (who also produced season 2 of the Mortal Kombat: Legacy series for Machinima -- go Marina!). I should also mention our talented cinematographer Martim Vian, who is a close friend and collaborator of mine. Martim designed his own LED lighting units with remote controlled triggers, so we could have total control over the interactive muzzle flashes (the guy is pretty brilliant). 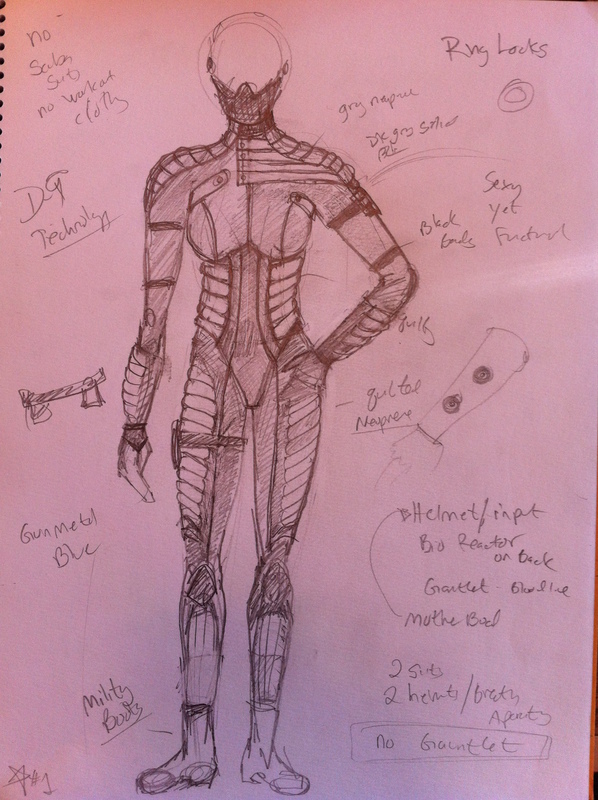 Our costume designer E.B. Brooks went without sleep for a couple days in order to finish up the costumes on time; she really put a lot of heart and soul into this project (EB also costume designed Higher Power, which looks amazing!). We were also lucky enough to have Paris Pickard work as Production Designer on the film. Paris and I have worked together several times now, and she always creates the coolest props and sets for me and my films. My 1st AD, Andrew Spieler, also did a wonderful job leading an ever-changing crew of volunteers and replacements as we made our way towards the martini shot. 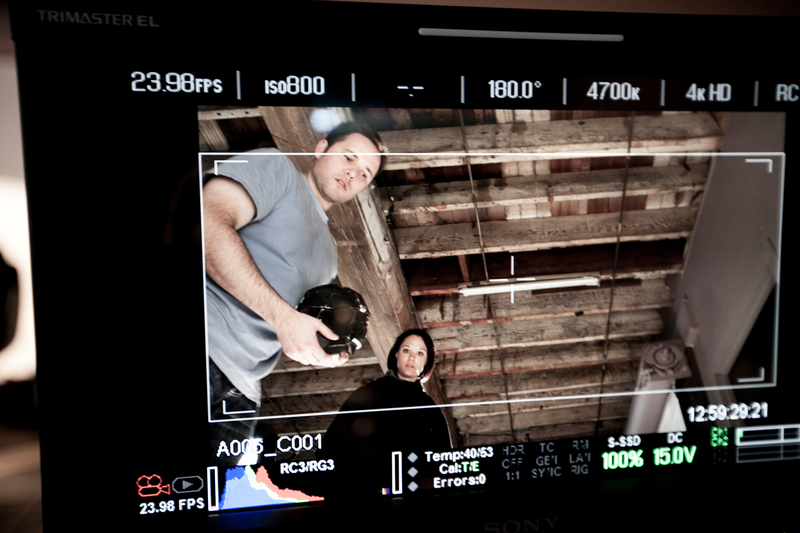 Andrew is also a great director and a talented actor, so it was a huge help having him by my side throughout the shoot. Last but not least, I hired my two little sisters, Natalie Baldini and Allyssa Baldini to run, grip, gaff, stand-in, fall, jump, freeze, drive and pretty much do anything/everything to get the film done on time. They were the inspiration for the two main characters, and the film wouldn't have been the same without them. A: A few years ago there was a news story about a teenage criminal who was leading authorities on a wild goose chase across the country: hi-jacking boats, stealing credit cards, breaking into empty cabins, flying small airplanes, and posting his exploits on social media. You might remember, they called him the "Barefoot Bandit". In any case, he was the impetus for the plot. I actually started developing the story into a choose-your-own-adventure digital series, but when I heard about the Prototype competition, I quickly started adding sci-fi elements to the world, while incorporating a little bit of the Edward Snowden/NSA controversy that was going on at the time. You have to remember, only a year ago we were all reeling from the discovery that a body of government was secretly spying on the entire country (and they are still are). The webcams attached to our computers were suddenly listening and recording us -- they were watching. I had also just finished reading a book called We Are Anonymous, about the rise and fall of hacktivist groups like Anonymous and LulzSec, and I found the world fascinating. Especially the notion of someone being trolled or blackmailed using embarrassing photos that were secretly captured via their computer without them knowing. The thought of the government being the one trolling was what inspired me to write the scene that ended up becoming the short. A: I wrote the script pretty fast, which is painfully obvious from watching the short (yeah, I said it!). In hindsight, I should have picked a different moment from the larger story to convert into the short film. I'm still very proud of the film, and I love the concept, but I only succeeded in setting up the feature world and contextualizing the characters. Now I want to explore the relationship of the sisters as they search for their father's real killer with the FBI hot on their trail. I'm hoping that I'll get the opportunity to tell the complete story one day. Our original production schedule was only three days of principal photography, but I ended up adding two more days when we were in post. I had always imagined using Rickroll Patrol's YouTube channel to set up the world and characters, but it was cut from the shooting script, per the competition's guidelines. When I got in the editing bay though, I was able to tighten things up and pull the trigger on the prologue to set up the world the way I had originally intended. So we spent an extra two days running around LA filming the girls on the run, as well as the host wraps for Rickroll's show. The girls were supposed to be filming themselves, so we shot most of it on smartphones to give it an authentic feel, which also made it easy for us to keep the crew size small and move quickly throughout the city. A: I had scouted several locations before settling on a loft in downtown LA, near the 6th Street bridge. It was pretty stressful leading up to the shoot because the location owner was unable to hold the building for us (given the low budget we were offering to pay him for the site), so we didn't know where we were shooting until 72 hours prior to the first day of filming. We had a couple other locations as backup options, but I really wanted to shoot at this loft because I knew it was best for Rickroll's character. He has a little bit more money to spend, given the popularity of his YouTube channel, so I wanted to find a location that looked like a gutted-out artist's loft where his character could both work and live in. Also, I really liked the look of the hallway directly outside the loft. For me, it didn't feel like your typical apartment hallway, and I wanted that specific portion of the film to have an otherworldly aesthetic, because that's when the curtain is really pulled back and we see this foreign tech and action at play. A: One of my favorite scenes is really just a moment at the very end, when the girls hold hands after they throw the grenade down the hall. That moment was totally improvised during the rehearsal and I really liked it. For me it's what the film is all about -- two sisters sticking together, for better or worse. Second to that would be when Shannon's character Audrey listens to the FBI shootout outside the door, and she mistakenly believes that her sister has been killed. It was the last setup we filmed, at the end of a twenty-hour day, the crew was wrapping out downstairs, and we had this deeply emotional and very sensitive scene to shoot. Only the DP, the sound guy, Shannon, and myself were there to capture this very quiet, intimate moment. It felt like we were really there with the character, and not the performer. I must admit that I was on the verge of tears while watching the monitor. Shannon makes great choices on camera, even when working with intense emotions. She's a true talent. A: My favorite memory from shooting would be when we were driving around Santa Clarita filming the girls running from the law. There are a lot of images in that sequence that had been stuck in my head for weeks, and that day they all (finally) came to life. On top of that, it was just a fun day with the cast and crew. About half way through the shoot, we had the girls drive down an empty two-lane highway in the middle of canyon country acting as if the CHP were hot on their trail (I was lying in the back seat while the girls improvised up front). Suddenly, in the middle of the scene, an actual CHP car came racing up behind us with the sirens blaring and lights flashing. Neither Shelby nor Shannon broke character, they actually used it in the scene while I quietly freaked out in the back seat, thinking we were going to be pulled over. The patrol car ended up zooming right past us. Q: Where did the ideas for the tech in this short come from? Were they (or the story itself) influenced by gaming at all? A: The short is definitely influenced by gaming, and that probably would have been more apparent if we hadn't been forced to change direction in the middle of the shoot. In the very first draft of the script, the girls were using a ray gun similar to the one available in the mystery box in CoD Nazi Zombies, where a plasma ring causes the zombie bodies to burst. But when we arrived to set on the first day, the site rep at our location forbid us from dressing the walls with fake blood or scorch marks, so we had to ask our VFX team (the awesome folks over at Locktix) to paint blood on the walls, which was a lot of rotoscoping work. In fact, it was so much work that we had to re-imagine the way the gun worked altogether, and how many bodies we could explode in the sequence. Ultimately, we decided that we could only blow up one body and there would be no scorch marks left over. So we transformed the ray gun into a microwave gun, a weapon that would cause sparks to ricochet off of metal (like a SWAT shield, or aluminum foil in a microwave), but could cause the human body to explode (the human body being 60% water). And all without ever burning or scorching the walls. So in the end, the gun tech was an amalgamation of gaming influence and science. We added the blue light in post to give it a visual look of it's own. The idea for the healing device was a similar story. 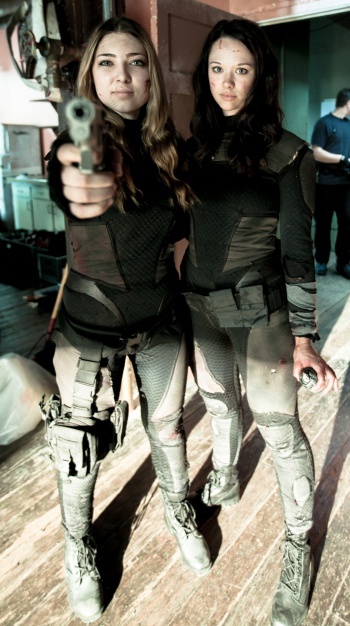 Originally, the girls were not wearing any body armor at all, it was just a helmet and a gauntlet that was connected intravenously to their forearms, and their skin healed right before our eyes with every bullet that hit them. But I quickly realized that we couldn't afford to do any of that and I needed to scale back the VFX if we were going to pull this off on time and on budget. So I began having discussions with my costume designer about how we could cover the wounds, and it just so happened that her brother has a PhD in material sciences, which definitely helped inform the look and the functionality of the suits. In the end, we decided to make the suits out of d30, a gel that solidifies when struck by high speed objects such as bullets, as well as a nano-scaffolding device that could help repair damaged tissue, but not instantaneously. We hypothesized that the gauntlet would work by sending nanites into the blood flow which could rapidly build tissue scaffolding for tissue regrowth by way of foam (there's something similar called XStat which is used to seal gun shot wounds in combat). And the helmets were connected to that device, monitoring all vitals and feeding oxygen through the helmet. Unfortunately, when the gauntlets arrived on set they didn't function the way we needed them to, per the script. So you may notice that there's a shot of Audrey bandaging her wrist after removing the gauntlet, but no explanation for it. That's because we were supposed to see the needle come out of her arm while the girls argued over how the tech worked. But I had to cut around it. So the tech makes sense to me while watching the short, but I'm afraid some people may very well be scratching their heads when watching that particular scene. When we do the feature/series, we'll be sure to delve deeper into the actual science behind the tech. A: The challenges we faced while changing the science and tech behind the story had a huge impact on the choreography of the big action sequence. It wasn't like we could just go from destroying the whole SWAT team with a ray gun, to killing just one guy and expect the rest of the original sequence to work as it was scripted. So during lunch on the second day of filming, I had to improvise and block the entire shoot-out in a way that was both cinematic and cogent. I can still remember the look of my special effects supervisor's face watching me while I rolled around that hallway, acting out every part in front of half the crew, while the cast ate lunch downstairs. 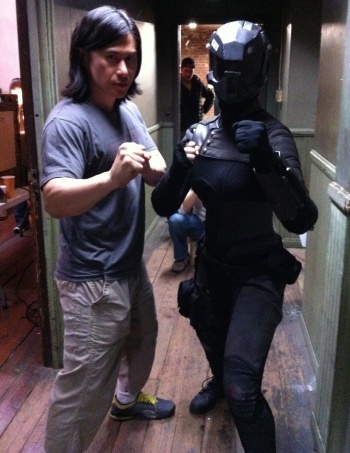 After we re-worked the sequence and plotted the girls' escape, our Stunt Supervisor, Ho-Sung Pak (who played Liu Kang in the original Mortal Kombat video game! ), came in with his Fight Choreographer, John Nania (aka Keanu Reeves' stunt double), and choreographed the actual hits, kicks and throws. 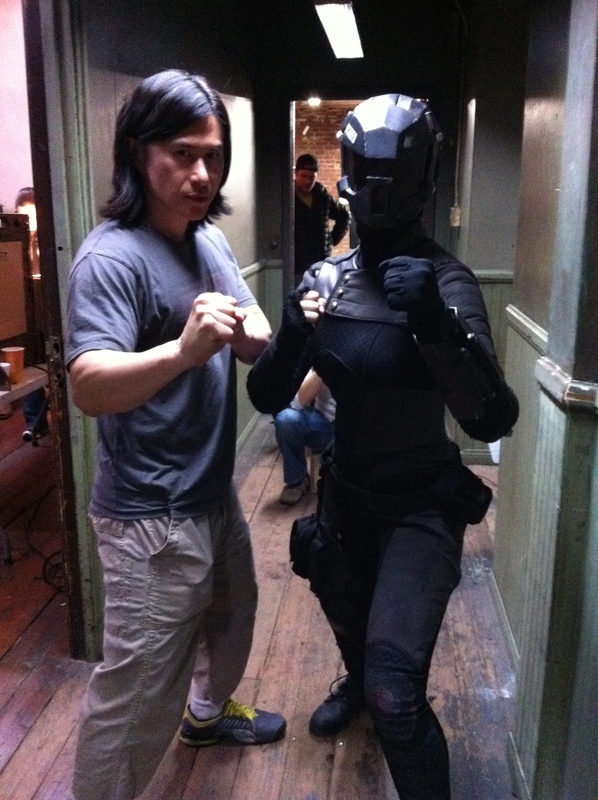 I'm a huge fan of Ho-Sung's work and absolutely loved working with him and his team. It's also worth mentioning that Shelby was actually in that suit performing all those stunts. She was practicing with John in between every scene, over and over, until the entire fight became like a dance. For me personally, I love filming action sequences. Stunt men and women are truly the coolest people to work with. The fact that they risk their well-being to get a shot, and usually do so with a sense of excitement and vigor, is always refreshing to me. I work really hard on my films, and it's always nice to work alongside people who are just as passionate about what they do. Tim Baldini began his film career as a teenage actor and videographer in Trimark's indie horror feature The St. Francisville Experiment. Soon after, Tim began working behind the scenes for several leading production companies and ad agencies in the Los Angeles area, honing a skill set that now spans multiple disciplines in film production. 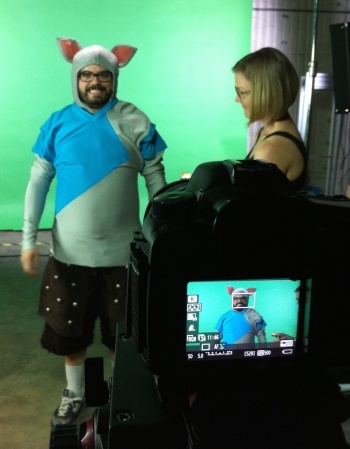 In 2009, Tim wrote, directed and starred in a short film entitled Mark & Tom which premiered at the LA Shorts Fest, subsequently earning him the chance to direct his first broadcast commercial for the popular video game DeBlob 2. Being a gamer, Tim took to live action video game commercials like a fish to water, and over the past three years he has directed commercials for brands such as Activision, Ubisoft, Disney, Microsoft and Machinima to name a few. Tim counts Stanley Kubrick, Quentin Tarantino, David Fincher, Spike Jonze, Mark Romanek, and J.J. Abrams as some of the filmmakers who have inspired him most. He's a fervent cinephile whose favorite films include Star Trek, District 9, Network, Apocalypse Now and Star Wars: Empire Strikes Back among many, many others. He currently lives with his wife in Santa Monica and is eager to prove his worth in the Prototype competition.